We take pride in introducing Bihar First, an ethnic village theme based luxury resort- Ghar Aangan, (A Unit of Muskan Event Management and Caterers Pvt. Ltd.) spreading over 25000 sq ft of beautifully landscaped area for a rustic look. For conferences we are having fully air-conditioned and well designed hall-Manthan, having a capacity of 200 chairs. If you want to organise a get-together or small party, there is Dalaan - the banquet hall, for you. It is too fully air-conditioned with well decorated walls and a capacity of 1000 guests. There is Pool-side arrangement for big gatherings/parties where 1000 guests can easily be entertained. Besides these the accommodation at Ghar Aangan comprises of 10 double occupancy Air Conditioned rooms with 24-hour room service. All are spacious, with attached washrooms, running hot & cold water, etc. 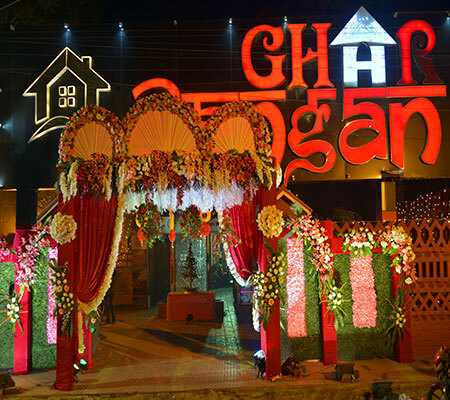 Ghar Aangan is an ideal place for a perfect party or get-together. It has multiple facilities fulfilling all the needs of its esteemed guests, especially those that are needed to make a guests' stay, a memory.Its quest for continuous improvement in terms of quality services & standards assures the guests that their comfort is in right hands. We believe that Real Bihar is still there in villages be it Mithla Paintings, the wall decorations, the fresh air, the evening performances, the enthusiasm, the litti chokha, the traditions, the costumes or at last but not least the feelings. At Ghar Aangan we bring that all for you. Our aim is to preserve and encourage the village art and culture, to get today's generation closer to their past, to change the philosophy of world about Indian village culture. The display of traditional huts and workmanship on its walls will take you back to the times when splendor was unpretentious. The artificial fountain with two different swimming pools- one especially meant for small kids and much more are here to rejuvenate you and your family. It is not wrong if we say that the combination of tradition and luxury is the hallmark of this resort. 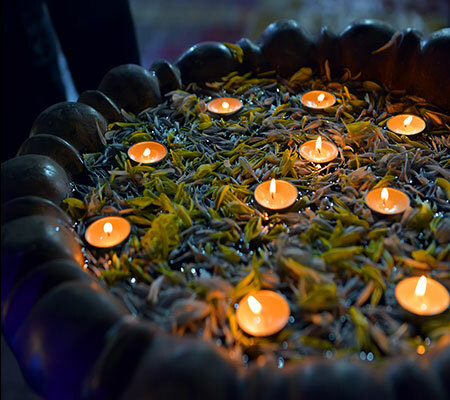 Experience the rich warmth and rustic charm of an Indian Village at Ghar Aangan, where festivities never end.